We have a summer camp at Canim Lake, just east of 100 Mile House, BC, which affords me the pleasure of fishing many of the excellent waters found throughout the region. Not far from our camp, the Canim River flows eastward into Mahood Lake. A hiking trail leads off the Mahood Lake Provincial campsite road and follows the Canim River back to the spectacular Canim Falls viewpoint, a scene that is well worth the walk. However, the canyon below the falls, although difficult to access, also offers river fishing for rainbow trout that is quite good at times! The river is fast, dropping rapidly in places as it travels through a rocky course to Mahood Lake. There are pockets of water that do harbour feeding and resting spots for resident rainbow trout and here is where the river muddler shines! Tail : White kip's tail. Hackle : Elk hair tied fairly flat. Head : Clipped elk hair. 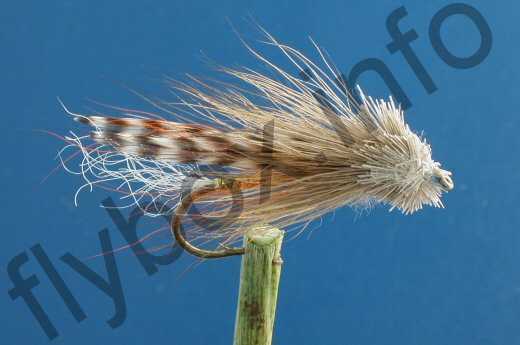 Wing : Orange deer hair with an overlay of two fine grizzly hackle feathers, then the hackle overlay as above. Tie in a small amount of white kip's hair to form a short tail. Next wind gold tinsel from the hook bend to the eye and tie off. Place some orange deer hair at the hook eye and tie down so that it flows back along the hook shank, no longer than the end of the tail. Then select two grizzly hackles the same length as the orange deer hair and tie them down on top of the deer hair.The final step is to spin a clump of elk hair also at the hook eye and clip the front two thirds to form a head. Next carefully push the remaining elk hair back along the top and bottom of the hook shank and tie it with your invisible thread just behind the head so that it remains flat rather than standing upright. Wind your thread through to the hook eye, tie off, cement, and you have finished an excellent river wet fly that can attract fish even in fairly fast water. Mustad dry 94842. Currently there are no comments about the River Muddler fly pattern from other fly fishermen yet.